Most people, at one point or another, do a little bit of cooking. But if you’re cooking not just out of necessity, but because it makes you truly happy, you have a true a passion on your hands—maybe even a viable career path. If you’re the kind of person who whips up dinner for friends and routinely hears “You should open a restaurant!” this might be the job for you! Are you interested in cooking, entertaining, restaurant management, or public health? 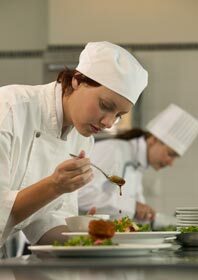 Culinary arts is a major that prepares students to pursue a career as a leader in the food service industry. Graduates go on to be chefs, executive chefs, caterers, restaurant managers, and restaurateurs, among other professions. The food service industry is demanding, fast-paced, and multi-dimensional. The culinary arts major prepares the student not just to be a superb cook, but to be able to manage all aspects of a successful food service operation, including employee supervision, inventory management, safe and sanitary food service production, and customer service. Job opportunities vary by region, but are generally good, in part due to high industry turnover. This speaks directly to the demands of sustaining a successful food delivery system. Many students pursue this program of study at a culinary arts school, but more and more colleges are introducing Bachelor’s degree programs as well. The plan of study is broad, for it aims to prepare the student for all aspects of the industry. Course work in cooking, nutrition, banquets and catering, and food service sanitation testify to the breadth of the required courses in this major. Students will have a liberal-arts course of study to complete as well. Students will begin actual food production early in the major. These will likely be co-op or internship placements in on-going commercial businesses, where the quality of the student’s work will be closely monitored. It is likely the hours spent in internship or co-op placements will increase program advances. Typically, final year students balance a full work and academic schedule. Expect to take classes like food service management, banquets and catering, human resources management, applied mathematics, food service sanitation, food service management, applied economics, and nutrition. Some related majors include food science, hospitality administration, human resources management, and nutrition. A strong liberal arts preparation in high school is recommended.